vCloud Director version 9 introduces support for the last major missing NSX feature – the distributed logical router (DLR). DLR provides optimized router which in distributed fashion performs routing between different logical switches in the hypervisor. The routing always happens in the hypervisor running the source VM which means that the traffic goes between maximum two ESXi hosts (source and destination) and no tromboning through third host running router VM is necessary. Read here for technical deep dive into how this works. This not only provides much better performance than traditional Edge GW routing, but also scales up to 1000 routed logical networks (as opposed to 10 on Edge GW or up to 209 if trunk port is enabled). Generally, DLR should be used for routing only between VXLAN based logical switches, although NSX supports VLANs networks with certain caveats as well. Additionally dynamic routing protocols are supported as well and managed by Control VM of the DLR. Now let’s look how vCloud Director implements DLR. The main focus was making DLR very simple to use and seamlessly integrate with the existing networking Org VDC concepts. DLR is enabled on Org VDC Edge Gateway which must be already converted to advanced networking. You cannot use DLR without Org VDC Edge Gateway! There must be one free interface on the Edge (you will see later on why). Once DLR is enabled, a logical DLR instance is created in NSX in headless mode without DLR Control VM (the instance is named in NSX vse-dlr-<GW name) (<UUID>)). vCloud Director can get away without Control VM as dynamic routing is not necessary – see later below. The DLR instance uplink interface is connected to the Org VDC Edge GW with P2P connection using 10.255.255.248/30 subnet. The DLR uses .250 IP address and the Org VDC Edge GW uses .249. This subnet is hardcoded and cannot overlap with existing Org VDC Edge GW subnets. Obviously the Org VDC Edge GW needs at least one free interface. New Org VDC networks now can be created in the Org VDC with the choice to attach them to the Edge Gateway (as regular or subinterface in a trunk) or to attach them to the DLR instance. For each distributed Org VDC network a static route will be created on the Org VDC Edge Gateway to point to the DLR uplink interface. This means there is no need for dynamic routing protocols on the DLR instance. In the diagram below is the networking topology of such setup. In the example you can see three Org VDC networks. One (blue) traditional (10.10.10.0/24) attached directly to the Org VDC Edge GW and two (purple and orange) distributed (192.168.0.0/24 and 192.168.1.0/24) connected through the DLR instance. The P2P connection between Org VDC Edge GW and DLR instance is green. DHCP relay agents are automatically configured on DLR instance for each distributed Org VDC network and point to DHCP Relay Server – the Org VDC Edge GW interface (10.255.255.249). To enable DHCP service for particular distributed Org VDC network, the DHCP Pool with proper IP Range just needs to be manually created on the Org VDC Edge Gateway. If Auto Configure DNS is enabled, DHCP will provide IP address of the Org VDC Edge P2P interface to the DLR instance. Up to 1000 distributed Org VDC networks can be connected to one Org VDC Edge GW (one DLR instance per Org VDC Edge GW). Some networking features (such as L2 VPN) are not supported on the distributed Org VDC networks. VLAN based Org VDC networks cannot be distributed. The Org VDC must use VXLAN network pool. 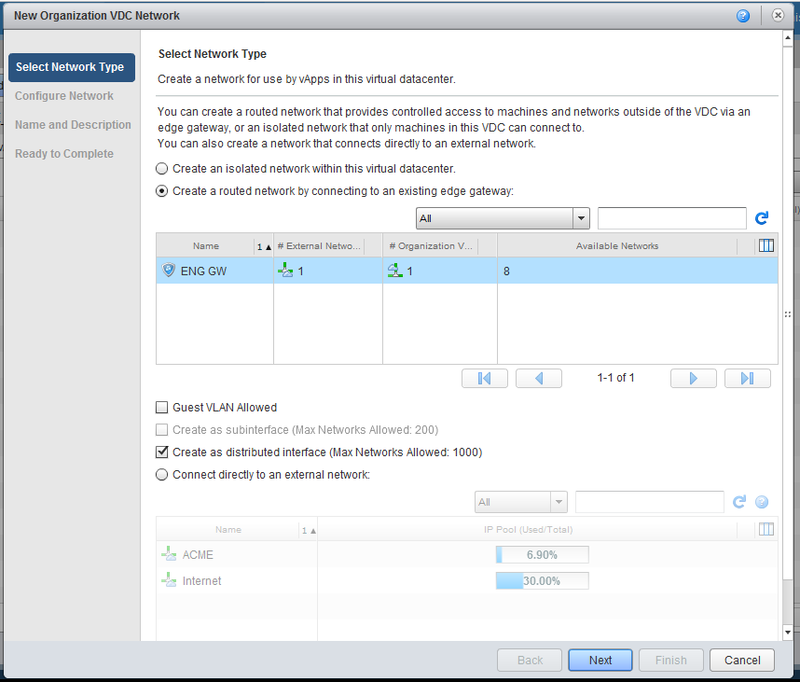 The tenant can override the automatic DHCP and static route configurations done by vCloud Director for distributed networks on the Org VDC Edge GW. The tenant cannot modify the P2P connection between the Edge and DLR instance. Disabling DLR on Org VDC Edge Gateways is possible but all distributed networks must be removed before. Both enabling and disabling DLR on Org VDC Edge Gateway are by default system administrator only operations. It is possible to grant these rights to a tenant with the granular RBAC introduced in vCloud Director 8.20. 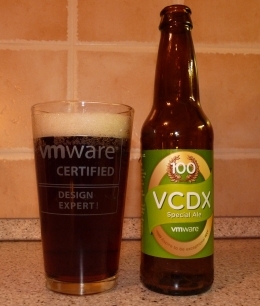 DLR feature is in the base NSX license in the VMware Cloud Provider Program. No need for cell reboot. Edit 03/10/2017: Existing Org VDC networks can be migrated from traditional to DLR or sub-interface based networks in all directions in non-disruptive way with running VMs attached. 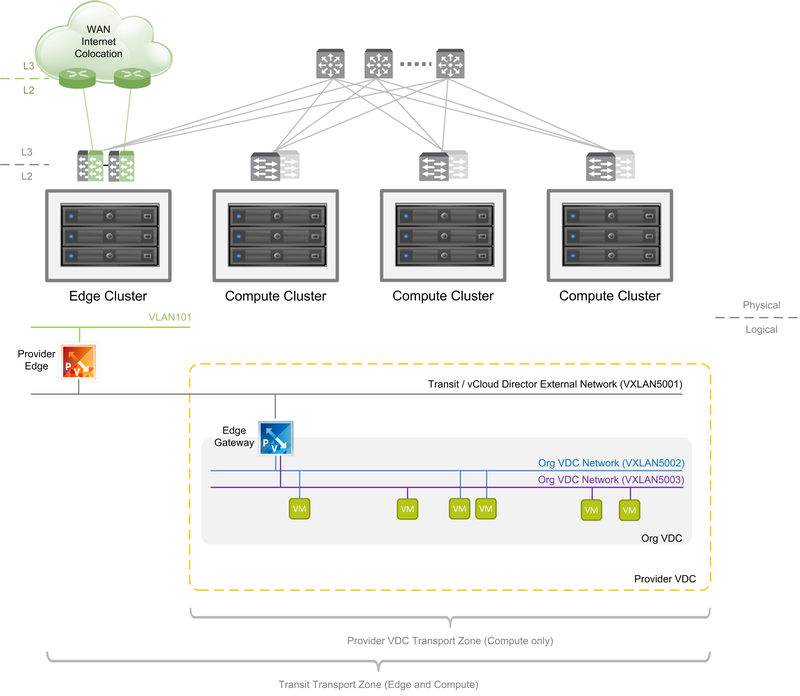 In my previous article vCloud Director with NSX: Edge Cluster I described various design options of NSX Edge Cluster in vCloud Director environment. In this article I would like to discuss additional option which extends the Design Option III – Dedicated Edge Cluster. Below is the picture showing the scenario from the previous post. 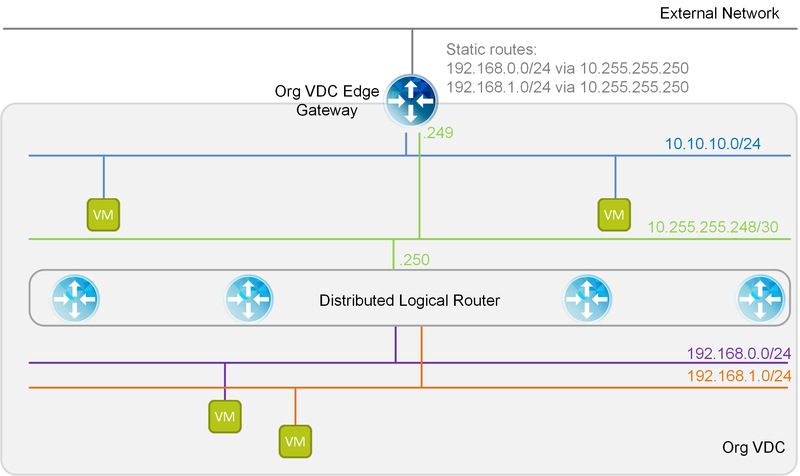 There is one Provider deployed Edge in the Edge Cluster for each Transit vCloud Director External network to which Org VDC Edge Gateways are connected to. The option works quite well for use cases where the Provider Edge is dedicated to single tenant – e.g. it is providing VPN services or L2 bridging. (Note that in L2 bridging use case the Org VDC Edge Gateway is not deployed and Org VDC networks connect directly to tenant dedicated external network). However when we want to provide access to a shared service (for example internet) where we will deploy multiple Org VDC Edge Gateways of different tenants connected to the same external network they will all have to go through a single Provider Edge which can become a bottleneck. As of NSX version 6.1 Edge Gateways can however be deployed in ECMP (Equal Cost Multi-Path) configuration where we can aggregate bandwidth of up to 8 Edges (8x10GB = 80 GB througput). High availability of ECMP Edges is then achieved with dynamic routing protocol (BGP or OSPF) with aggressive timing for short failover times (3 seconds) which will quickly remove failed path from the routing tables. The problem is that (as of vCloud Director 5.6) Organization VDC Edges are deployed in the legacy (vShield/vCNS) mode and do not support ECMP routing nor dynamic routing protocols. The design I propose will get around this limitation by deploying Distributed Logical Router between Provider and Organization VDC Edges. The picture above shows two Provider ECMP Edges (can scale up to 8) with two physical VLAN connections each to upstream physical router and one internal interface to the Transit Edge logical switch. 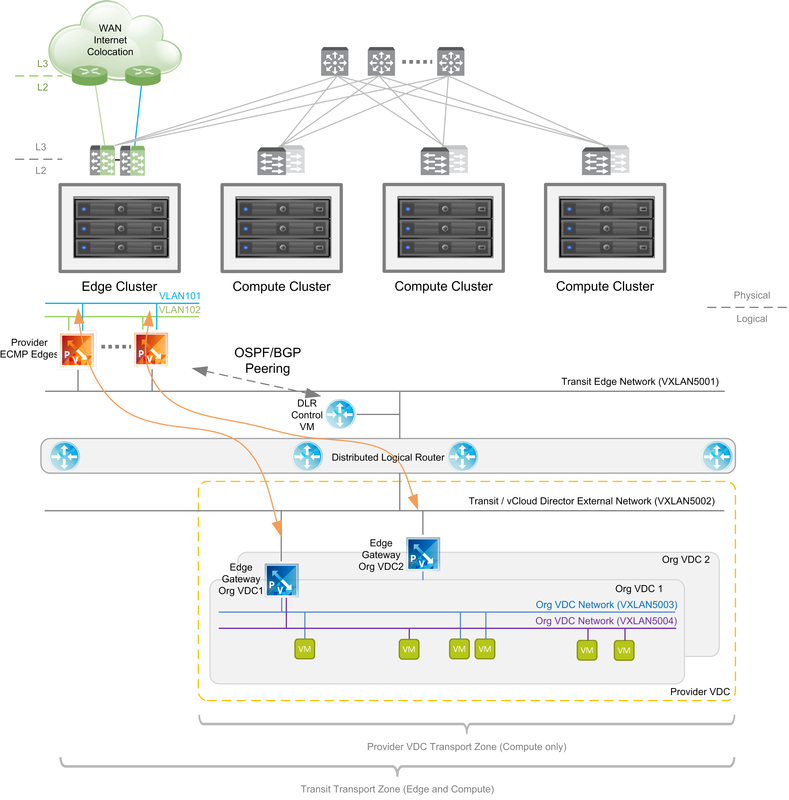 Distributed Logical Router (DLR) then connects the Transit Edge logical switch with the Transit vCloud Director External Network to which all tenant Org VDC Edge Gateways are connected to. The DLR has ECMP routing enabled as well as OSPF or BGP dynamic routing peering with the Provider Edges. The DLR will provide two (or more) equal paths to upstream Provider Edges and will choose one based on hashing algorithm of source and destination IP of the routed packet. The two shown Org VDC Edge Gateways (which can belong to two different tenants) then will take advantage of all the bandwidth provided by the Edge Cluster (indicated with the orange arrows). The picture also depicts the DLR Control VM. This is the protocol endpoint which peers with Provider Edges and learns and announces routes. These are then distributed to ESXi host vmkernel routing process by the NSX Controller Cluster (not shown in the picture). The failure of DLR Control VM has impact on routing information learned via OSPF/BGP protocol even if DLR is highly available in active standby configuration due to the protocol aggressive timers (DLR control VM failover takes more than 3 seconds). Therefore we will create static route on all ECMP Provider Edges for the Transit vCloud Director External network subnet. That is enough for north – south routing as Org VDC subnets are always NATed by the tenant Org VDC Edge Gateway. 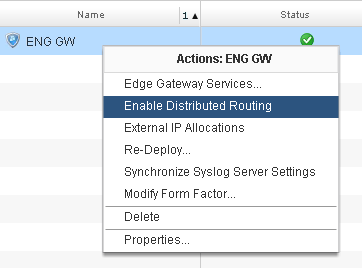 South – north routing is static as the Org VDC Edge Gateways are configured with default gateway defined in the External Network properties.